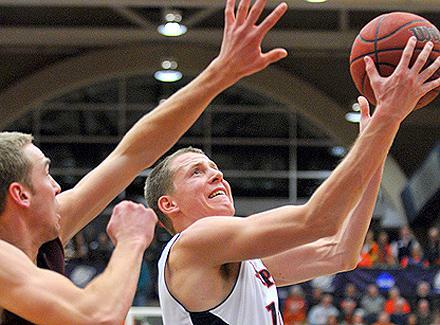 Hope senior guard David Krombeen (Grandville/Grandville HS), who led the Flying Dutchmen to an unbeaten conference season and a berth in the NCAA Division III tournament, has been named the most valuable men's basketball player in the Michigan Intercollegiate Athletic Association (MIAA). Teammate Nate Snuggerud (junior from Zeeland/Zeeland East HS) joins Krombeen as a first team honoree while Peter Bunn (senior from Lansing/Lansing Christian HS) was named to the All-MIAA second team. A four-year starter, Krombeen was co-captain of the Flying Dutchmen as a junior and senior. This season he averaged 15.1 points a game, including 14.7 ppg in conference games. He ranks second alltime at Hope for assists and steals.He becomes the 23rd Hope player to receive MIAA MVP recognition. Among the former MVP honorees was his coach Matt Neil (1982). The Flying Dutchmen posted a 26-1 regular season record and enter the NCAA tournament later this week with a 22-game winning streak. Three members of the Hope women's basketball team have been presented conference honors by coaches in the Michigan Intercollegiate Athletic Association (MIAA). A total of four Hope College students were named finalists in the Opera Grand Rapids Collegiate Competition held on Friday, Feb. 24, at the Betty Van Andel Opera Center in Grand Rapids.